CROSBY'S TRAVELS "THE BIG TRIP"
Welcome to the CROSBY'S TRAVELS Website. We will take you on an interesting vacation trip around a lot of the United states.We'll start in Florida, travel across the lower States then upward to Yellowstone, then across the top to Illinois down to Missouri and back thru Georgia to South Florida. This trip starts in West Palm Beach, Florida on may 2nd. The mileage on our Chevy S-10 reads 7650.The rubber hits the asphalt at 6am, we're ready to go! We get to Dianne's mothers house in Covington, Georgia at 5:30pm.Hungry again! !We have good vegetables and beef for supper, and are joined by Dianne's brother and his family along with one of our kids & two grandchildren. Head out thru Atlanta to our son's house who is getting married in two days. 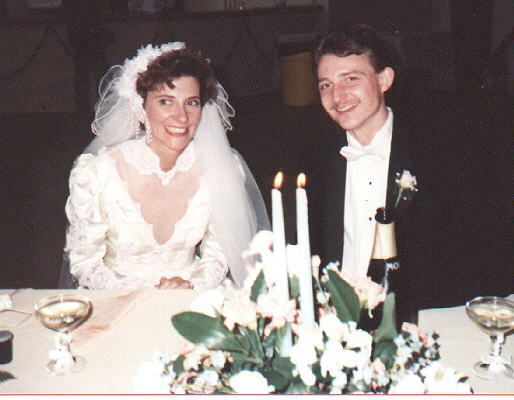 Dianne & I are doing the rehersal dinner for about 40 people.We arrive in Kennesaw and talk for awhile...then off to the Olive Garden for lunch [$12.50], next stop is Sam's & the grocery for rehersal dinner supplies. Back to the kids house, but they are all at work. Wedding guests start arriving..local & out-of-towners. The dinner goes real good, but we're very tired and hit the sack...Big day tomorrow. Up at 8am to get ready! Head for the Church at 11:30am for picture taking. Two loooong hours of pictures & waiting.Our grandaughter wouldn't have her picture taken or walk down the aisle as flowergirl...Her brother did a good job as ringbearer.Wedding over at 2pm, but more pictures.On to the reception...good buffet .We took a lot of videos and pictures. We leave early for the house...tired city!! Got a early start, 5:30am.Mileage reads 8978.We eat breakfast in Temple,TX.,lunch at a Pancake house [$11.50].Boy, the road flowers in texas are really beautiful.They're everywhere!! We arrive at our sons house in San Antonio,TX. at 2pm. We all go to "Tom's Ribs" for supper [$58.60], It was really finger licking good. We do the tourist thing today. Went to the Alamo [really neat],and had to be told to remove my hat. 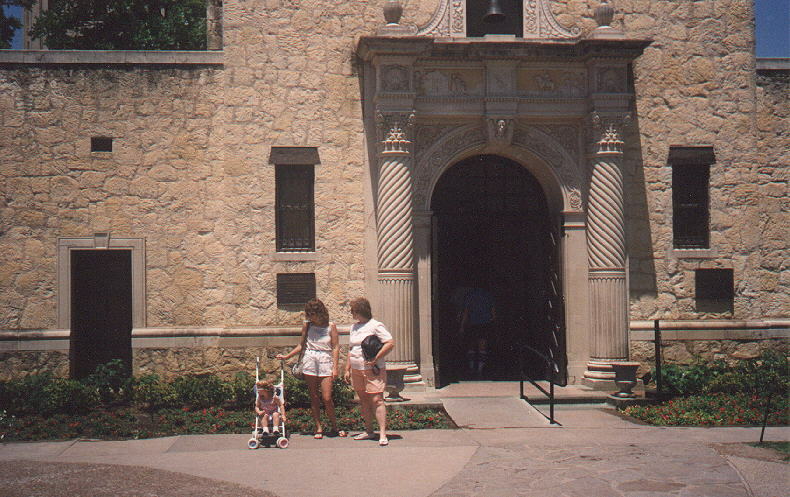 Dianne,Nancy & Tif at THE ALAMO. We walked and took boat ride at River Walk, Saw the Sunken Gardens which were beautiful. The kids rode us all around showing us the sights of San Antonio, then home for a good supper & a relaxing evening. On the road at 2pm, headed for Carlsbad Caverns,NM. Odometer reads 9342. Stopped by a pottery place and spend $8. We see a "SAS" shoe outlet and they take us for $150.00, We both got a pair of shoes and Dianne got a purse for Mothers day, which is this Sunday. It was such a beautiful drive on I 10 towards New Mexico.We decide to stop in Sorona for the night & hit the Caverns tomorrow.[$33]. Found a Pizza Hut for supper [$20]. Breakfast next to motel [$7]. Hit the road 7:15am. Mileage reads 9999, really giving the S-10 a workout this week. Stop in Ft. Stockton for gas and a Wallmart break [$13]. Next we spotted a place called the "West of the Pecos "museum.Boy was this a neat place! !It was a real Saloon back in the ooooold west days.A big place with lots of rooms filled with real old stuff of that period. Even bullet holes in the bar. Well worth the $6, it cost. We stopped in White's City, close to the caverns.Les bought a hat [$8]. We arrive at Carlsbad Caverns about 2pm and take a self guided tour [$9].Was very interesting..you walk at your own pace thru the caverns and use the tape recorder to hear about what you are seeing.We buy a box lunch inside the caverns [$4]. We're not here at the right time to see the cave bats...Bummer... We also take a 9 mile car tour over the desert in the National Park..sure is different from Florida! Spend the night at the Continental Inn in Carlsbad [$33].Have a delicious steak dinner at the Sirloin Stockade [$20].It is really windy here..our S-10 needs a bath badly!! 7:30am we're outa here.Bkfst at the Deluxe Cafe [$6.50]. Stopped at a tourist trap & spent $12.50. McDonalds for lunch [$7].Munchies at a grocery [$3]. We're headed towards Albuquerque.Its 1:30 mountain time, 2 hours behind our watch. Odometer reading 10551. Drove into the Nat. Park and have breakfast at the Lodge, where we will be staying for the next two days[$10.50].The Grand Canyon just took our breath away.Words cannot express the way you feel or the way it looks.AWESOME does not even come close.What a beautiful place God made for us to enjoy! The park is not real crowded this time of the year, so we are able to drive to all the overlooks in the truck.Take a lunch break at the McDonalds outside the park. [$8.50].Caught up on the laundry in the park laundrymat[$1.50]. Bought souveniers in the Lodge giftshop [$12.50]. Rested awhile then went to see the sunset....so beautiful! We had dinner in the Lodge cafeteria [$15]. We're getting up early to go see the sunrise over the canyon, so off to bed..
Get up at 4:15am & head for the Canyon...Boy it's COLD & WINDY!! but worth every minute of torture.Supprised at the large number of people out here doing the same thing. We reward ourselves by going to the "El Torvar Lodge" for breakfast.Dianne had the best pancakes she ever had, and our table was in front of a large picture window overlooking the canyon...indescribeable! [$16]. After bkfst. we head for Bright Angel Trail. We walk partway down, but no way are we going to the bottom a mile down.They remind you, it's harder comming back up! The people riding mules come by and Les takes lots of good video. "They're crazy"!. Great dinner in the Arizona Steak House, located in the Bright Angel Lodge.Another wonderful view of the canyon while we eat.Came back to our Lodge & got a large cinnamon roll to share over a cup of coffee in our room.Watched TV, played cards, and read info. about Yellowstone Nat. Park. What a great day!! 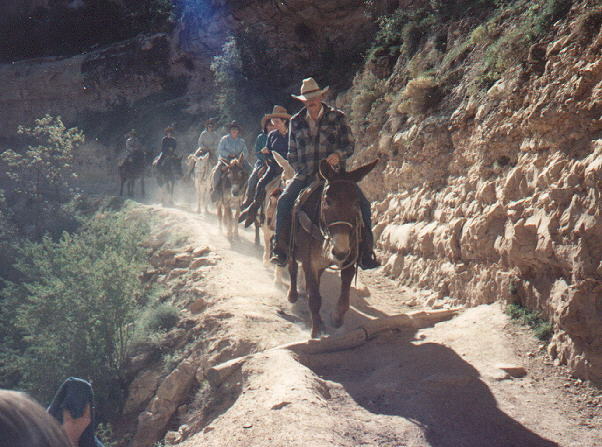 Mule Train headed down the canyon! 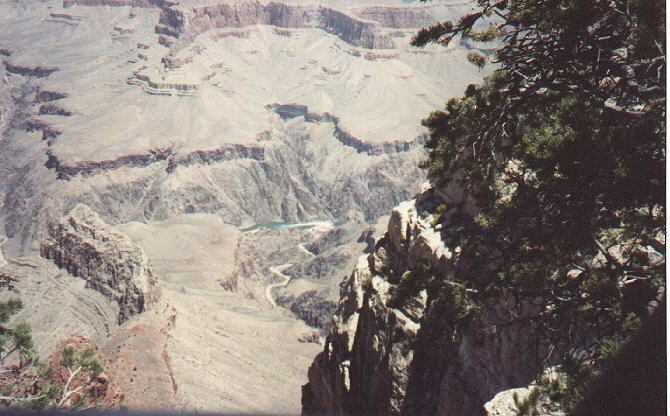 Checked out of the Lodge [$114], and headed out.On our way we stopped at the overlooks on the east rim of the canyon, more GREAT views! !We're headed for Zion Nat.Park next.Hit the Cliff Dwellers Restaurant in Marble canyon for lunch [$12.50].I can't believe we missed breakfast today!! The odometer now reads 11257. We make it to Zion, can't believe such a pretty place.This time you are at the botton of the canyon looking up...breathtaking. We get lucky and get a cabin at the park lodge[$70]. Ate in the dining room with a $23 view of the mountains. Settled in the cabin about 7:30pm and get video of four deer feeding in front of the cabin. No TV so we play cards & go to bed. Breakfast at the Lodge [$11]. Another great view out these windows.We're anxious to see the park. It's 55 deg. this morning, so it felt good to climb up 1/2 mile to "weeping Rock". The water weep's out of the rocks there and it's like a sprinkling rain all the time. Such a pretty place & so peaceful. A creek running alongside the trail & the birds singing. Far out!! Also took the one mile walk to the "narrows".A place where there is hanging flowers everywhere on the cliff walls. This is one of the most beautiful places I have ever seen. Midday we head out again..Don't know how far we'll get, but we're trying for Salt Lake City. We hit a BurgerKing at 3pm [$9]. We are about 75 miles from SLC now. Odometer reads 11588 now. Stopped in Provo for an oil change for the S-10[$21]. Then off towards Yellowstone again.Another wonderful day...we're really racking them up!!! !OOPS, we made a wrong turn and went about 50 miles out of the way..Oh well. There is snow on the ground now, but it is a pretty drive thru lots & lots of rolling hills.Stayed in a motel in Montpelia, Idaho for the night [$29]. Ate supper at Butch Cassidy's Restaurant [$12.50]. Had the biggest pancakes I've ever seen for breakfast, they covered the entire platter. Les had his usual.[$7]. 7am,wheels hit the asphalt again. We stop in Jackson,WY. (30 miles from Yellowstone Nat.Park. ),and buy camping supplies.[$52]. Also, gas up [$13.20].It's very cool this morning..50 deg. Sun is making an appearance. Hopefully it will warm up nicely for our camping. We are going thru the Teton's now. All the mountains are covered in snow. We are seeing so many different types of nature. The mountains are white and meeting the white clouds, they are so high!! Such a beautiful sight. I forgot to note before we got to Jackson, we saw 7 deer walking beside the road together. Such a sight, the hunters in the family would really have enjoyed that! We have seen lots of them cross the road during our trip. Finally reached Yellowstone!!! Everything seems to be closed.We spot a few Buffalo aways off...grab the cameras and take distant pictures...Didn't know that there would Buffalo all around us in the road shortly..
We have a picnic lunch near a closed visitors center and then ride around. Climbing higher we come into a snow storm and a open visitors center.Some roads are still closed because of the snow.We follow the snow plow around. We are unable to get a room in the park, so we will camp.Now it's hailing and we're headed for Madison campground.Not too many other idiots camping today, so we have our pick of campsites.We "happily" set up the tent.It's in the 40's. We build a fire and cook burgers for supper. Played cards in the tent, then went to bed. It's so cold!! Woke up to a cool 30 deg. Cooked breakfast, broke camp to go sightsee We're staying in a motel tonight. Walked all around to see Old Faithful and the other Geysers (5miles), and saw some go off!! 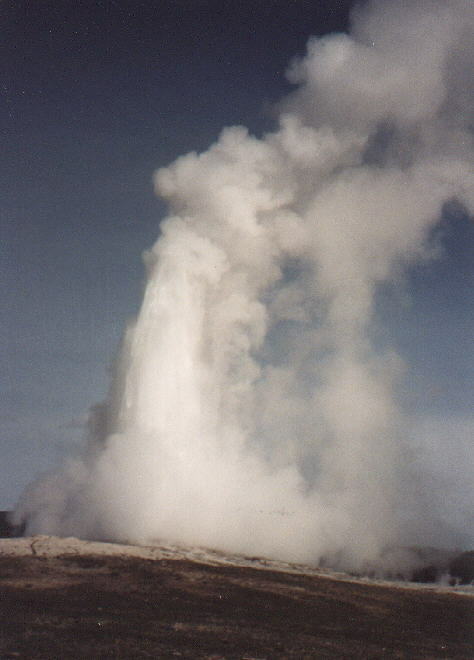 Old Faithful erupts about every 45 to 90 minutes,lasts from 2 to 5 min. and reaches a height of 100 to 180 feet. Real nice but we are tired.Rested for awhile.Went to Snow Lodge for lunch...had stew and soup [$10]. We ride to the Upper, then Middle and the Lower geyser basin ..Saw the Norris geyser basin, then went to Mammoth Hot Springs...So many Elk grazing. The rock were beautiful. We're off to the Canyon area. It's snowing again...A Lot...There is a lot on the ground also. We are almost alone in this area.Saw the upper and lower waterfalls, what a beautiful sight, so much water, and we were so close to it. 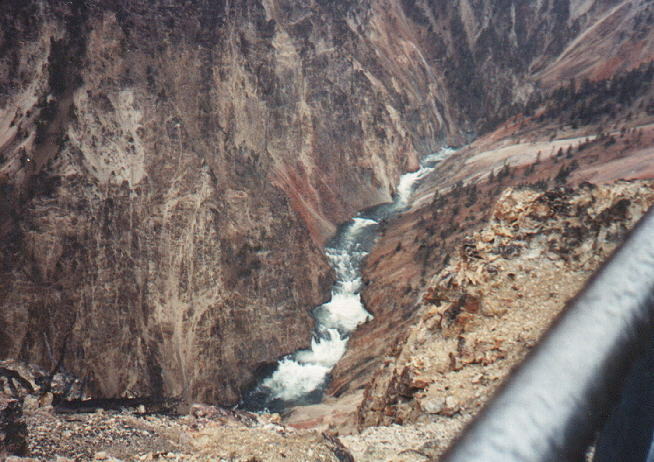 What a Gorge also, the Grand Canyon of Yellowstone. Inspiration Point, truly is awsome. Les ran out of batteries for the VCR at the Mud Volcanoes, he was really dissapointed. We then headed out the East exit. What spectacular views, high mountians covered in snow and snow on the side of the road as high as our truck windows.A really beautiful drive, but treacherous. The road was fairly narrow with straight down drop-offs.Then it got dark.But we finally reach Cody, WY. about 9:30pm. Find a Motel 8 [$33],eat at the Pizza Hut next door [$12]. Soak in a hot tub bath and hit the sack..What a Day!! !